Marrakesh, Morocco – December 20: England’s Bronte Law set a new record at Lalla Aicha Tour School with a winning five-round total of 26-under-par 334. 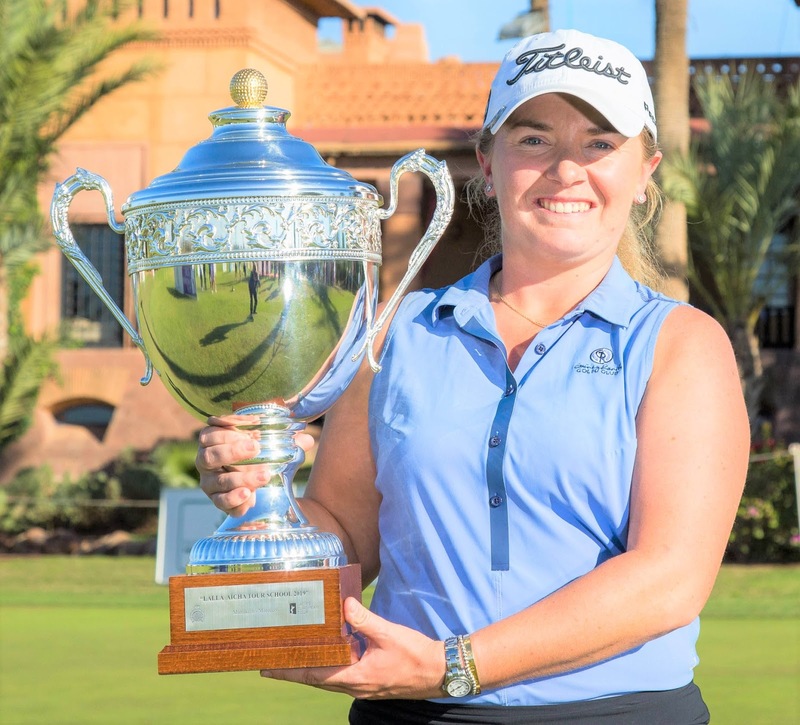 After rounds of 70, 71, 62, 64 and 67, she finished one stroke ahead of Sweden’s Linnea Ström, who ended with a final round of 66 at Amelkis Golf Club in Marrakesh. “I’m very happy. I played some very good golf this week and coming into it, I hadn’t had much time to practise and prepare due to having an injury. "I worked my way into the week and playing some good golf in the end was really nice. I’m definitely looking forward to next year and building on this experience. Law started her final round by sinking a 15-footer for birdie on the first hole and then made a tricky six footer for another gain on the fifth, before hitting a wedge to within tap-in distance on the sixth. Her next birdie came on the eighth, where she converted a putt from eight feet. After 41 holes without a bogey, she dropped her only shot of the day on the 10th, where she three-putted, but then almost made a hole-in-one at the 13th. Another birdie followed on the 14th, where Bronte tapped-in for a total of 26-under. After making great putts on 15, 16 and 17, which all burned the edge of the hole, she found the bushes left of the fairway from the 18th tee and had to chip out, but she reached the green in three and had two putts for the win. England’s Sian Evans, 27, who works full-time as a PGA professional at Kings Hill Golf Club in Kent, finished in fourth place on 16-under-par. She set up a Just Giving page to fund the trip to Tour School and was slightly tearful after proving to herself that she could mix it with the best. She said: “This has literally the best week I could have asked for and I couldn’t have done it without my caddie, Jake. He’s been my rock this week. I’ve had loads of messages already and I’m so glad I’ve done everyone proud. In a play-off against Sarah Nilsson for fifth spot, Ireland’s Leona Maguire holed a 15-foot birdie putt on the first extra hole, the 10th, to secure the fifth and final card in Category 5C. She said: “I’m delighted. I knew going into the play-off that that one spot would make a huge difference for next year. I’m just delighted that I could birdie it and get that fifth spot. I’m excited to play with some new golfers in new places. On a day of travel chaos at London Gatwick airport, Law determined that she would not be missing out on Christmas in Barbados. Whilst she was out on the course, her mum booked her a new flight back to Manchester with a view to travel from there to Gatwick, hoping to fly out to the Caribbean the next day. 347 Leona Maguire IRE 68 70 70 72 67 (900), Sarah Nilsson SWE 74 70 68 69 66 (900) (Maguire bt Nilsson in play-off for fifth place which guarantees her entry to LET eventd in 2019. 358 Agathe Sauzon FRA 73 71 74 70 70, Mariell Bruun NOR 71 72 76 70 69, Alison Muirhead SCO (am) 73 73 70 71 71, Chloe Leurquin BEL 72 71 74 68 73, Maria Hernandez SPN 68 74 71 71 74, Rachael Taylor SCO 71 70 70 72 75, Vikki Laing SCO 75 68 69 71 75, Kim Metraux SWISS 72 71 71 74 71.